Gift planning made easy! Our guide to creating a strategic gift plan all year long will make it seamless from start to finish. Truer words were never spoken when it comes to strategic gift giving, especially when the items are business gifts. While the majority of companies rely on holiday business gifts to do the job, the reality is that consistent gifting throughout the year is how you can best demonstrate appreciation, celebration and thankfulness for the relationship. A strategic gifting plan is a blueprint for the different ways you will reach out to clients, customers, vendors, employees and others important to your business via gifting. It will also turn an overwhelming item on your to-do list into a seamless strategy year after year. Every strategic gifting plan should address the multiple gifting touch points throughout the year: gifting to people and gifting for events or milestones. For the “people” element, identify key events such as work anniversaries, birthdays, promotions or other causes for celebration or recognition in your clients’ lives and yearly calendars. For “events and milestones,” consider product launches, company picnics or parties, giveaways or treats shared at trade shows, industry events and conventions. Plan ahead for the holidays to take the pressure off of last-minute gift research and ordering. Begin the seasonal process in August to lighten the load. Determine gifts by the person’s position in a company. What you get for a CEO will differ from a junior account executive, though all should be well thought out. Set a budget for each event and each person. Now that the planning is strategized, it is time to think of the actual corporate gifts. Bulleted below are some incredible ideas by occasion that will make your clients and colleagues smile all year long. 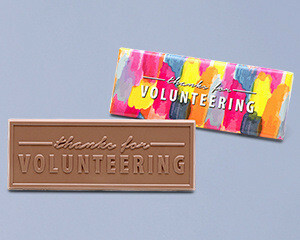 Classic wrapper chocolate bars: Sometimes a simple “thank you” for stopping by is enough to keep the conversation going. 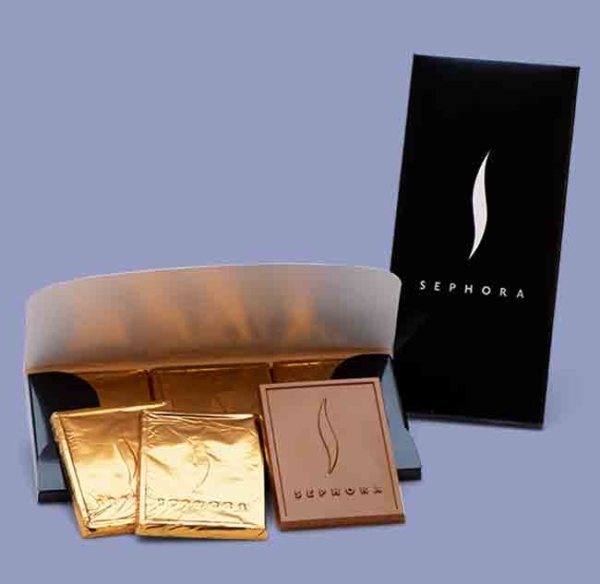 Add a custom twist to these classic wrapper bars as a treat to customers and prospects you meet with. 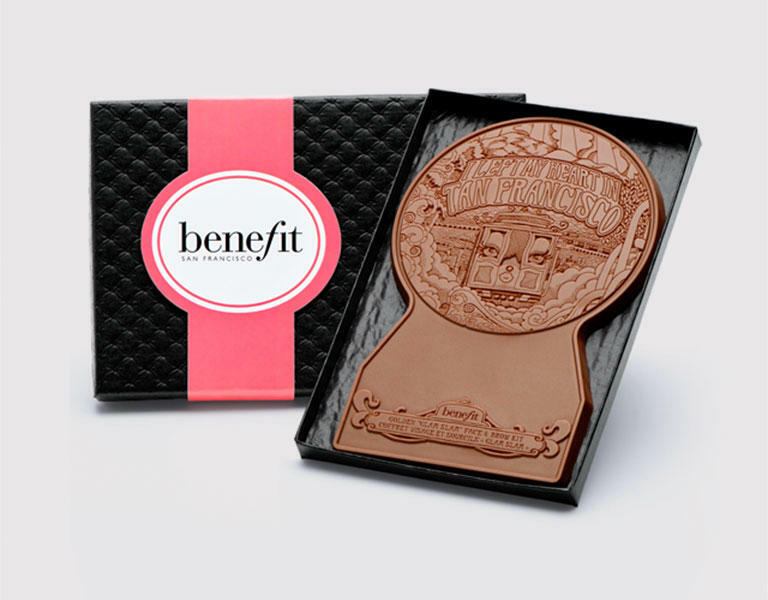 Custom shapes: Be the talk of the trade show with a custom shaped or custom-engraved chocolate treat. 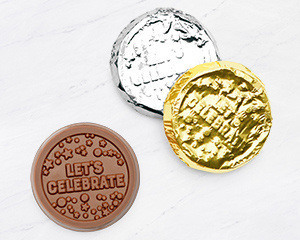 Foil-wrapped coins: An assortment of foiled squares or other shape, made of delicious Belgian chocolate engraved with your logo are fast and easy giveaways. 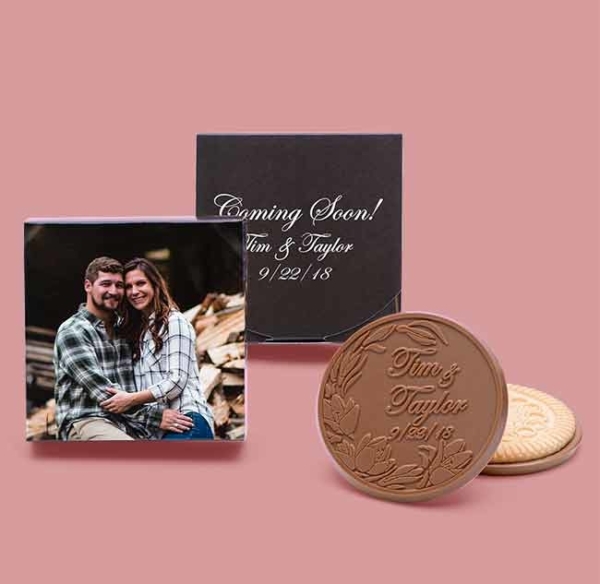 Individually wrapped cookies: Everyone loves a tasty sugar cookie, especially when it’s topped with a custom design engraved in milk or dark Belgian chocolate! Engraved Belgian chocolate business cards: Make a statement with an impressive Belgian milk or dark chocolate 2″ x 3″ chocolate bar designed to look like your business card. Whether it’s a post-BBQ dessert or a fun, memorable way to make s’mores, the classic wrapper bar makes a delightful impression. Your wrapper artwork covers every angle of the wrapper – front & back! 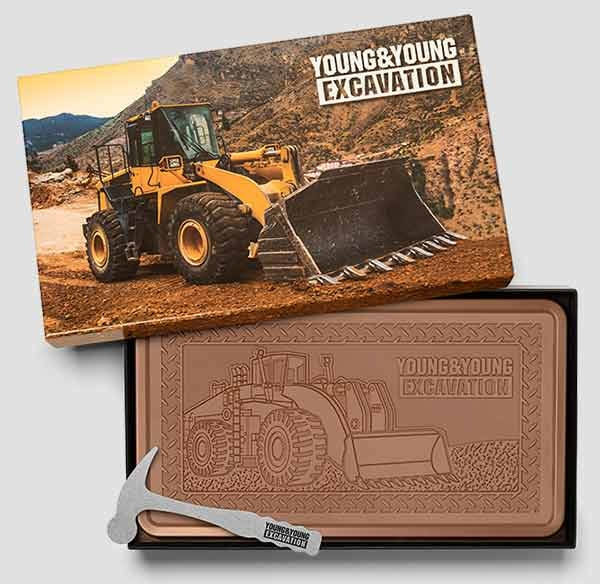 Your custom artwork covers the full chocolate bar so you can make the most of your custom chocolate design. Landing that highly sought-after client or customer deserves a celebration. 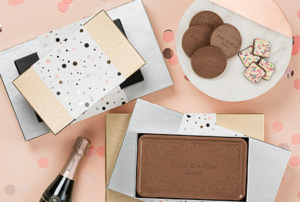 Why not indulge with a two-pound chocolate bar recognizing the occasion? 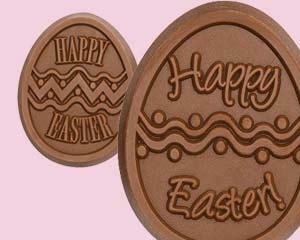 Or, consider a 12-piece cookie set, pre-engraved with a celebratory message. When you feel really indulgent, why limit yourself? Do both in a specially wrapped two-piece gift tower! Send everyone home with a party favor they’ll never forget… a crisp, mouth-watering collection of peppermint bark snowflakes, presented in a hand-drawn, beautifully-crafted candy cane foil-wrapped box. Or consider featuring a Belgian chocolate gourmet popcorn mix as an alternative to the traditional sweets offered at the dessert table. Foil-wrapped coins, rectangles, squares and hearts: Simple, yet memorable, these shapes offer a delightful way to support your new product launch. Far from ordinary, these pure Belgian chocolate treats are available in a wide variety of foil colors to match virtually every color scheme. Custom shapes—Your product has unlimited potential, so should your launch gift. 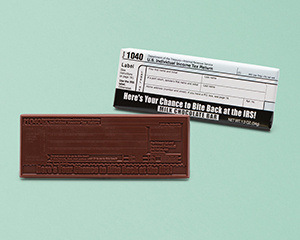 Totally Chocolate’s exclusive technology lets you create a totally unique shape that represents your new product. No shape is impossible, no level of detail is too difficult. 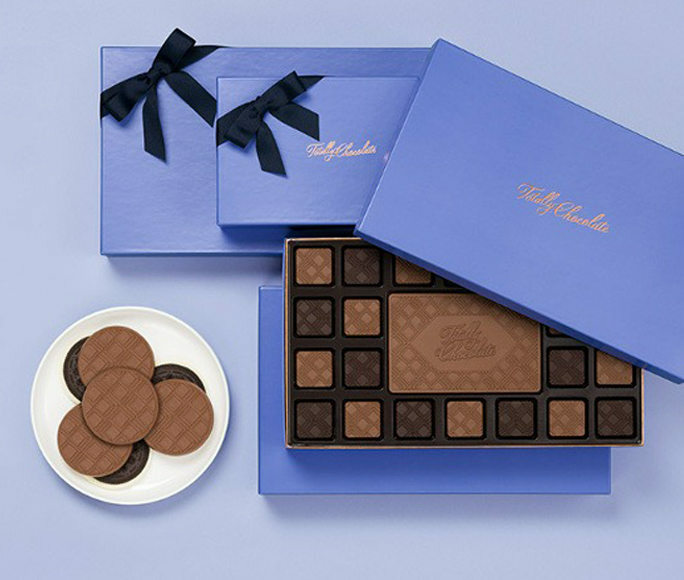 When you launch the best, you need the best, which means you want Totally Chocolate custom shapes as part of your product launch plans. Fully custom—When you want to make business personal, WOW them with a thoughtful, delicious, unforgettable gift that sets you apart from the rest. Make a lasting impression and put our team of chocolate specialists to work for you in creating a one-of-a-kind chocolate masterpiece. 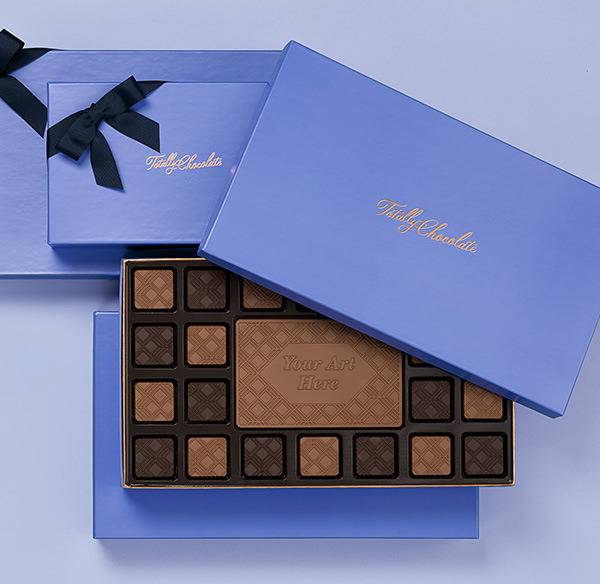 Choose from our foil embellished sleeve collection, luxe boxes with cream bows or have our art department design a fully custom lid for any Totally Chocolate fully custom engraved Belgian chocolate gift. 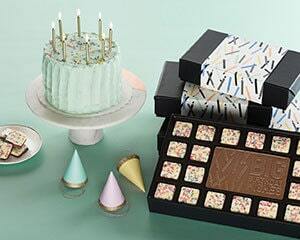 Customized—Choose a featured product and jump into the Totally Chocolate Customizer where you can play with different designs flavors, box colors and even add your own art or message to make it a truly personalized gift! 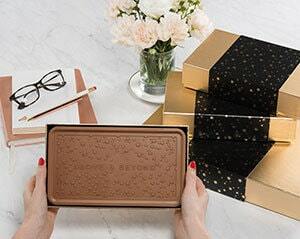 Whether it’s a Belgian chocolate bar, a peppermint bark ensemble, or set of engraved cookies, a Totally Chocolate gift lets you add a personal touch to your holiday business gifts. Ready To Gift—Pure Belgian chocolate in a stunning array of products, flavors, assortments and designs, ready for you to deliver instant gift-i-fication! Choose dark salted caramels, cookie sets, chocolate ensembles, indulgent two-pound chocolate bars, peppermint bark snowflakes or gift towers featuring a variety of gourmet popcorn, chocolate-drenched pretzels, European-style chocolate-topped cookies and more! 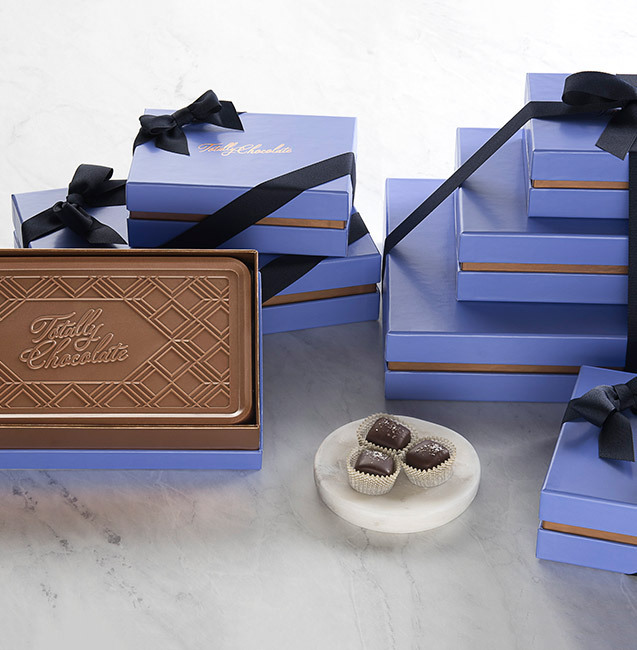 Offered in four different, hand-drawn, custom-crafted luxury packages designed for every aesthetic, Totally Chocolate’s holiday selection is guaranteed to totally impress! 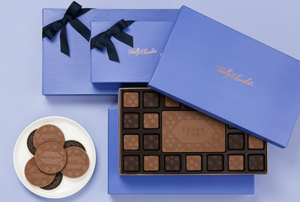 Custom shapes—These simply divine Belgian chocolate shapes are custom crafted and precision engraved with your logo. Keep them on hand to share with new hires and WOW them on their first day. Trust us when we say you’ll definitely make them feel a welcome member of the team. 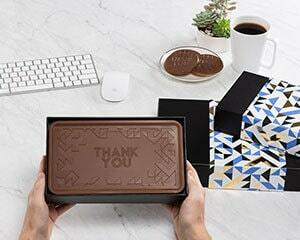 Chocolate foiled pieces—Even a 3-piece printed envelope with a trio of chocolate pieces tells new hires they’re part of something really special. 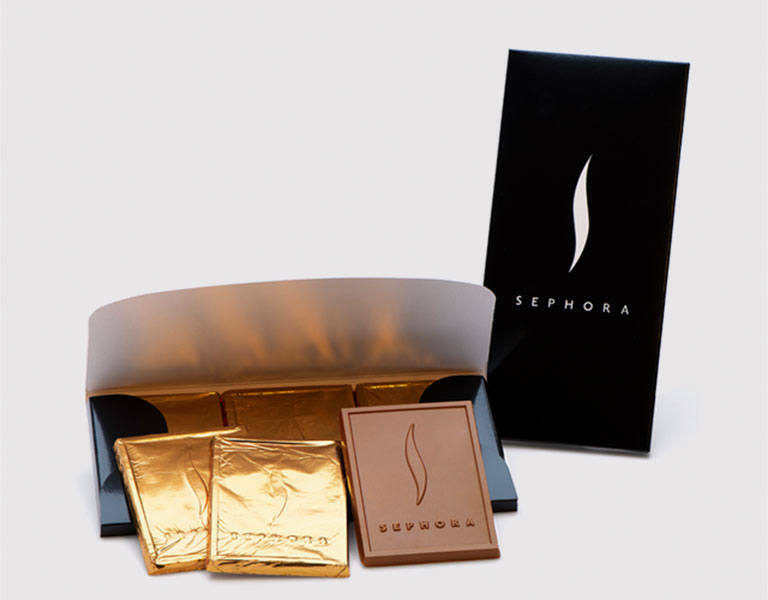 The full-color printed box is an attractive display of your logo and the custom chocolate artwork will impress, too. 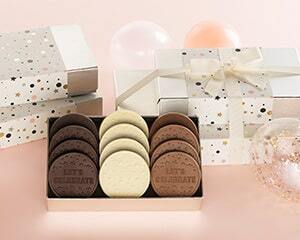 Chocolate-topped cookies—A 2-piece cookie set, in either sugar cookie or chocolate cookie, topped with thick, velvety, delicious Belgian chocolate has a custom printed box and the cookies are precision-engraved with your logo.